The workforce is very diverse and multicultural, resulting in a successful and productive working environment. BAPCO offers excellent training to its staff with development courses for all levels of employee. They also offer plenty of both cash and non-cash benefits to its workers and a host of other benefits including competitive salaries, allowances, free medical care both for employees and their families and accident and life insurance. There are also many excellent incentives to encourage loyalty including complimentary fuel top ups and the employee's Sadeem card. There are also many regular events held for employees and their families like family fun days and other activities. You can find all of the latest jobs at Bahrain Petroleum Company listed on the company's own website. By clicking on their Careers link and searching for current vacancies, you can see all of the most up to date listings across all of the available departments. There is also the option to apply for general vacancies by simply submitting a general application with your resume. There are also posts advertised on other general job listing portals like Careertracing and Indeed where you can search for jobs that suit your skills and experience and apply online. 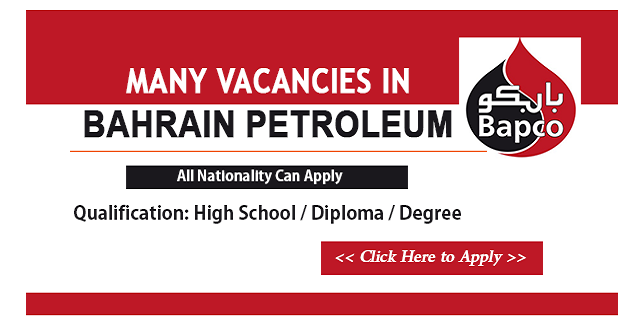 If you are interested in applying for the latest jobs at Bahrain Petroleum Company you can apply online through the company's own website's career portal. You can complete the online form with your personal details and educational and work background and then your application will be passed on to a recruitment personnel specialist within the company who will assess your application and then let you know if you have been invited to an interview. Alternatively, you can simply send off your up to date CV to the company for general perusal so that you can be matched to any suitable vacancy that may arise. If you are matched to an existing vacancy, you will be invited to an interview at the company, most often with the manager of your prospective department, where you will be able to ask any questions and demonstrate your skills. If you are successful in your interview, you will then be offered a position with the company. What Skills And Qualifications Are Necessary? The skills and qualifications required for a job at Bahrain Petroleum Company depend on which role you are applying for, however many of the posts are very technical and therefore require the applicants to have a clear knowledge of the industry and several years of experience working in a similar role. At the very least for an entry level post a good level of high school education is required, however most jobs require a degree level qualification as well as industry specific qualifications.